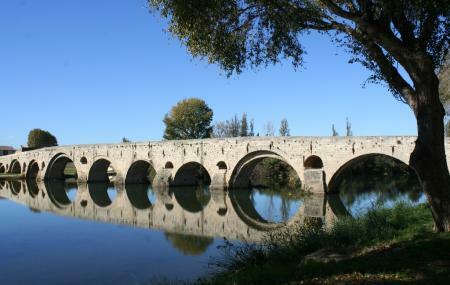 This 12th century Romanesque bridge crosses the river Orb. It is 5 metres long, 260 metres, and has 19 arches. It was never really structurally sound, and thus went through multiple renovations through the centuries. However, it is a magnificent building, especially considering the time it was built. For a long time, it was the only way to get to Toulouse from Provence without wetting your feet. That’s why they call it a historical monument now. If you’re going across on it on a vehicle, know that it is one way. Tourist tip: stand on the Pont Neuf that runs parallel to this bridge, and click a picture of it. It is one way only, leaving Beziers and heading to Narbonne. How popular is Le Pont Vieux? People normally club together Plateau Des Poetes and Ecluses De Fonserannes while planning their visit to Le Pont Vieux. Built in 1134 this romanesque bridge has withstood the passing of time well, and is an excellent vantage point to view the historic district above. Nice place to see the water need cleaning though. Very nice looking old bridge over the river orb, with great views of the cathedral.